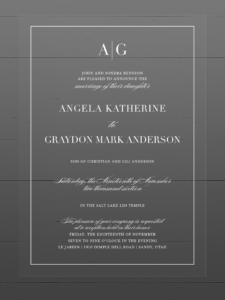 Stand out with one of a kind transparent wedding invitations from The Invitation Maker. 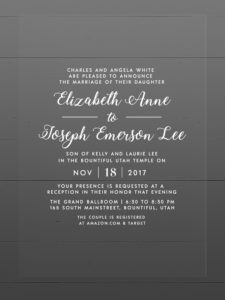 Transparent wedding invitations (Clear Wedding Invitations) are still an up and coming style that your guests are not likely to have seen before. They’ll be impressed by the elegant white text standing out against the clear invite background. 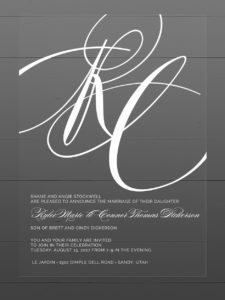 This unique look is not something being offered by every printer, and nobody can match the price and speed that The Invitation Maker delivers. 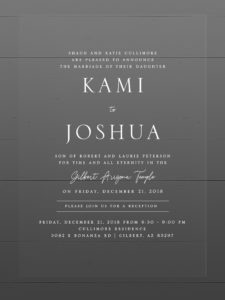 You’d expect to pay exorbitant prices for such an upgrade but The Invitation Maker offers clear invites for a nominal fee above our normal paper invitation pricing. Get more info about whether this eye-catching style might be the perfect way to announce your big day. Are you ready for something fresh, new and unlike any other invitation you’ve seen before? 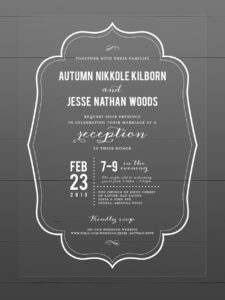 We can have your transparent invitation cards ready and delivered to your door in as little as two weeks. Start today if you have a tight deadline or request a sample in the mail to make sure it’s the right style for you and your fiancé. 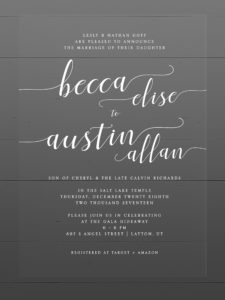 When you work with us, you’ll pair up with a dedicated designer who will work with you on your invitations from start to finish. 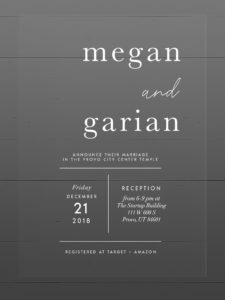 They will provide expert advice and design talent, efficient communication, and digital proofs to keep you in control as your invitations are being made. You will be able to oversee the entire process from your computer for maximum ease and convenience. 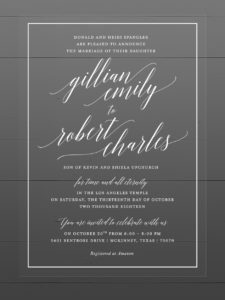 The Invitation Maker is the clear choice to fulfill your clear wedding invitation wishes. Your invitations will not be complete without coordinating save the dates, rsvp cards, inserts, and envelopes. Get your addresses printed on the envelopes to save precious time before mailing. Contact us today or read our FAQ to learn more about how it works.